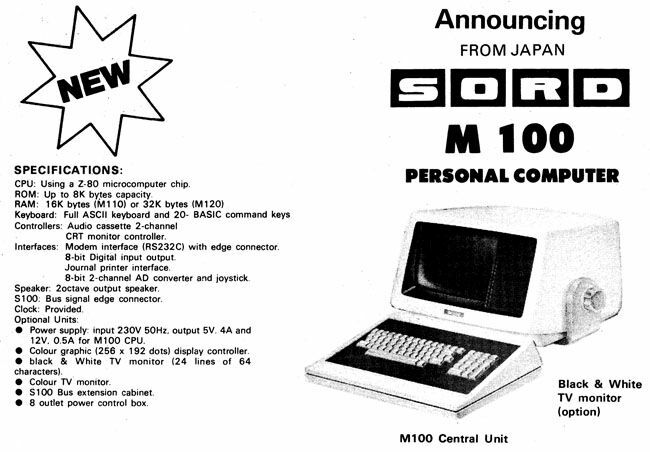 Archaeologic It took Japanese micro maker Sord more than six months to launch its M5 home computer in the UK, but in April 1983, the company said the Z80A-based machine would finally go on sale during the following month - half a year after it was originally scheduled to arrive over here. It was a bold move. Even in November 1982, when the Sord M5 was first scheduled to debut, the UK home computer market was becoming uncomfortably congested. More to the point, it was dominated by British firms: Sinclair, Acorn and Dragon, and Tangerine offshoot Oric and Camputers were both gearing up to release home micros of their own. Oxford’s Research Machines dominated the education micro market. There were overseas computer makers who were successful over here in the home market: Commodore primarily but also, though to a lesser extent, Atari and Texas Instruments. Apple was selling its pricey II to business buyers, and IBM was starting to do make inroads into the same market with its 1981-launched PC. But the Japanese? They were nowhere close. Only Sharp and Epson were making any headway in the business micro market, but neither they nor their fellow firms were attacking the home arena. It was arguably a point of pride among native computer companies that this was the case. They were adamant that they were not going to let Japan’s major electronics firms destroy the UK home micro industry they way the Japanese had smashed domestic hi-fi makers. Sord Computer Systems was no Sony, JVC or Sharp, of course. It was founded on 15 April 1970 by Takayoshi Shiina and his mum, and in its first ten years had become one of Japan’s fastest growing firms - the fastest, it claimed at the time - thanks to its success selling business micros on its home turf. Sord, by the way, came from ‘SOftware haRDware’, Shiina said in a 1979 interview with the Sydney Morning Herald. When the company opened a beachhead in the UK early in October 1982, it was forecasting an annual turnover of £40 million - equivalent to £167 million now, depending on how you measure it. To put that 1982 figure into context, Sinclair Research reported revenues of £27.17 million for the year to April 1982, rising to £54 million during the following 12 months. Sord’s pitch to British home computer buyers was typically Japanese: a machine clearly designed for playing games rather than thrashing out your own code, or running a small business. The stylish M5 had a prominent Rom cartridge slot and came with a pair of Mattel Intellivision-style wheel-based games controllers. 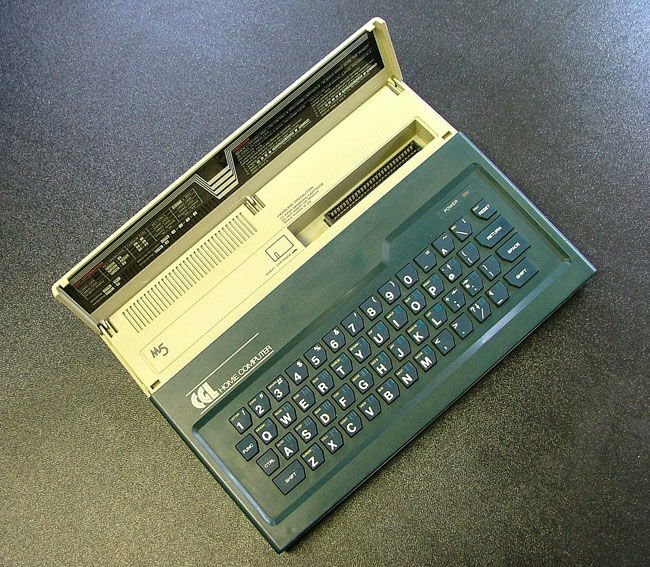 Like other home micros it supported the Basic language, but the interprester came on a cartridge rather than a firmware chip within the machine. The M5 packed 8KB of Rom for its operating system. Other cartridges allowed it to run PIPS, Sord’s business automation system. The M5 spec was suitable games-centric too: only 4KB of Ram but an additional 16KB dedicated to the video sub-system. The resolution wasn’t spectacular but it was comparable to that offered by other micros of the time: 256 x 192, with 16 colours. But it had the capability to run 32 separate 8 x 8 or 16 x 16 graphic sprites - a facility then only offered by the Commodore 64, at that time as readily available to Brits as hens’ teeth, and the Texas Instruments TI-99/4A. It had four-channel sound too - three for tones, one for “noise” - and its processor ran at an impressive (for the time) 3.6MHz. Handling the video was a Texas Instruments TMS9929A chip. 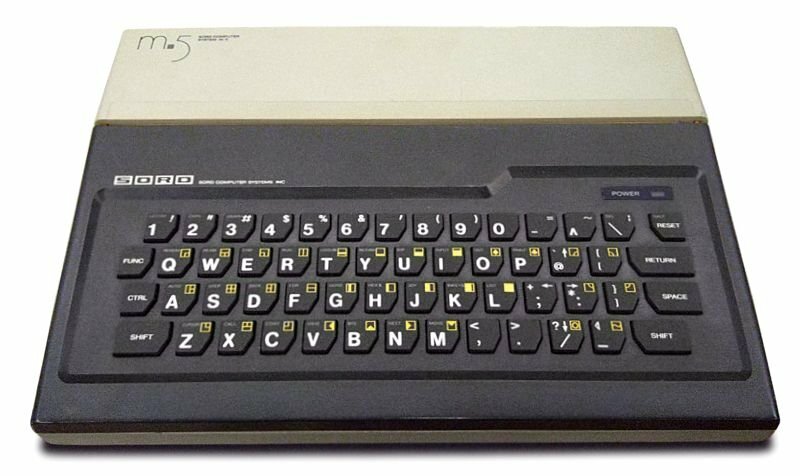 It had the same sound chip, the TI SN76489A, as the BBC Micro. When Sord took the wraps off the M5 in the UK at the end of October 1982, the machine had been on sale in Japan for less than a month but had already notched up a software library of 60-odd applications and games, the company claimed. Sord said the M5 would cost around £150. Inevitably, it was a no-show. Due to go on sale here in November 1982, by mid-December Sord was pointing to a February 1983 release instead. Most likely, the parallel attempt to establish the M5 in the US, which saw the M5 debut there as scheduled, along with the M343, an Intel 8086-based MS-DOS machine, took all the units Sord had earmarked for Blighty. Exchange rate fluctuations and other factors saw the price now listed as £169, though it would now come bundled with three cartridges, Sord promised: Basic and a couple of games. Sord also had an eye to the broader British micro market. Come March 1983 there was still no sign of the M5, but the Japanese company had by now signed a distribution deal with Loughton, Essex-based Computer Games Ltd (CGL) to allow it, as CGL Chairman Paul Balcombe said at the time, to “concentrate its efforts on promising its business computer range”. CGL had experience importing Japanese handheld videogame devices. It would later be acquired by Amstrad. That was still in the future. Now the question was, would the M5 ever be released in the UK? Toward the end of April 1983, Sord President Takayoshi Shiina flew into the UK to state that, yes, the M5 will go on sale here, in May. Oh, and it’ll now cost £190 - £189.95, to be precise. By way of some sort of compensation, the M5 would gain the ability to take extra memory, to be made available in 16KB units from July, Shiina said. Some punters might have preferred to wait a little longer. Sord also announced it would offer the M5 Turbo, a faster version with “at least” 64KB of Ram in October, the same month in which, it also promised, it would ship a 16-bit business machine, the M12. Impecunious kids exasperated by the M5’s pre-release price rises were offered the prospect of a low-cost games-only machine, the M2, due to arrive in August. Sord even boasted it has a battery-powered portable machine not unlike Epson’s HX-20 in the works. It would go on sale in September, the company promised.